Posted on November 25, 2016 April 24, 2019 , in Hot Tubs. Nearly every hot tub has some massage capabilities, but the best hot tubs offer a complete, full-body therapeutic massage. 4-zone massage systems are among the best for providing targeted therapy to alleviate headaches, stress, insomnia, and body pain. They can also help with sports recovery. Below, you’ll find out how to pick the hot tub that will give you an incredible therapeutic experience. The best massages will come from hot tubs where jets are strategically placed to target your pressure points with many different massage options. Hot tubs that have differing jet arrangement in each seat often provide the widest range of full body massage choices. While a hot tub with many jets is hardly ever a bad thing, don’t assume that just because there is a high number of jets you’ll receive a therapeutic massage. Make sure the hot tub you choose offers a wide range of massage programs for your therapeutic requirements. Back and leg pain, diet support, sports recovery, stress, insomnia, and headaches are just some of the options available when you choose a Hydropool hot tub. Hydropool has learned through extensive research with physiotherapists and chiropractors that most experts recommend hot tubs with four seats and a range of jet types and placements. Their hot tubs are designed based on this research and have been used by several pro sports teams because of it. Four-zone systems work by allowing users to select a therapeutic program on the touch pad. The user begins in the seat labeled zone one, and then notifies users when to move to the next seat. Through this system, users receive whole body therapy. The four-zone system is the only system that is able to address each individual’s therapeutic needs. For example, if you are experiencing neck pain, you’ll be able to select a program that will target it. You’ll sit in zone one for 10 minutes while the massage gets rid of spinal and dorsal muscle tension. Next, you’ll move to zone two, which will relieve lumbar tension for 10 minutes. In zone three, tension in your shoulders, upper back, neck, and trapezoid muscles will be alleviated. The Hydropool Wellness Guide that comes with your hot tub will help you understand the massage capabilities in more detail. Aromatherapy and chromatherapy (light therapy) can truly enhance your massage experience. 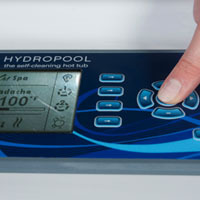 Hydropool has developed many of these therapies through consultations with Clinique, a top French wellness company. They can also alleviate stress and tension, improve your mood, energize you, help you sleep, and more. You can learn more about these therapies in your Wellness Guide. Now that you know more about the best massage options, you’ll be able to choose the best hot tub to meet your therapeutic needs. To learn more about how to select the right hot tub for you, download our Hot Tub Buyer’s Guide!